The cheap things are not always the best things; rather, they are of inferior quality lacking the capacity to stand the test of time. More often than not, cheap things are always the first option of the poor and never an option to the wealthy. It is part of this mentality that has always separated the poor from the wealthy. The poor choose quantity over quality, in contrast to the wealthy who choose quality over quantity. Poverty is first a state of mind before it manifests physically, the same is true about wealth. Anything on earth considered to be cheap does not last long, as it fades with time; this is why bargaining for the cheapest secondary school in Ibadan is risky. It is important to know that from any school rated to be the cheapest secondary school in Ibadan, you can expect poor quality education in the reality that the teachers there are underpaid, with little or no incentives to give their best when it comes to teaching and tutoring the students. This paints the picture of the students being left to their own intuition and instincts on answering questions, which may not be the best way to learning effectively. Other problems like poor classrooms, lack of basic amenities needed for a good education, like a well-equipped computer room, music lab, sports field and others. The absence of these, create a deprivation of the students from developing all round into mentally, emotionally, physically well-rounded individuals. Schools can create a state of mind that is capable of pushing dreams into realities, fostered by an effective education, and a place where the mind is free to explore creativity, where dreams can become reality. This place is at Seed Life Secondary School, one of the best private secondary schools in Ibadan. Here, we provide quality, affordable education from nursery level, to primary level, to secondary level. The availability of these amenities in Seed Life is adequate for the proper development and functioning of students. Among Ibadan private secondary schools, we are reputed in having a well-equipped computer laboratory to develop the technological skills of our students, good quality classrooms equipped with chairs, desks, ceiling fan, white marker board, light bulbs and well-ventilated windows to ensure comfort in class. Unlike the staff in the cheapest secondary school in Ibadan, our staff is well paid and trained, which put them in a position of giving their best to the students in terms of tutoring and teaching. The teachers also provide an approachable atmosphere where students finding difficulty understanding a subject can look up to them to explain to them through personal tutoring. Also, moral values are imprinted in the hearts of the students, making them well behaved and cultured when they are in the midst of outsiders. Extracurricular activities including Sports, press club, science club, music and performing arts are also practised here. The aim is to provide our students with all aspects of education needed for wealth. 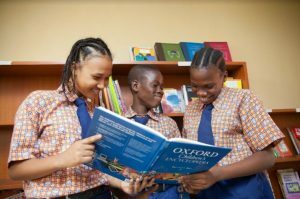 If you are also interested in enrolling your child in a solid Ibadan nursery and primary school, you need not look any further as we have the best primary school in Ibadan. Do well to contact us now.